Audio Pro multi-room review | What Hi-Fi? Can Audio Pro make waves in the multi-room market? “Simplicity is the ultimate sophistication,” said Leonardo da Vinci. That sentiment has been echoed by great minds as diverse as Albert Einstein and Pep Guardiola, and has been the subject of musings as far back as Confucius. It also appears to have been a mantra adopted by Audio Pro, whose Addon wireless speakers earned the Swedish manufacturer three What Hi-Fi? Awards last year. Having now embraced multi-room, it only points to a potential sweep of this market in the future. The triumvirate on trial in this test are the Award-winning Addon C5 speaker, its larger (and even more sonically talented) sibling the Addon C10 and the Link 1 (whose job it is to connect existing hi-fi components or wireless speakers into the chain). For their part, the two Addon speakers are pretty much visually identical but for the discrepancy in size. 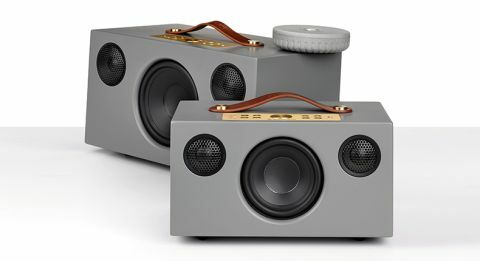 They are a pair of smart, appealing boom-box-style speakers with a familiar driver configuration - the 'koala bear' design that has become these speakers’ distinguishing feature. The difference in cabinet size is ultilised in the Addon C10's larger mid/bass driver – 13cm in diameter, compared to the Addon C5’s 10cm. The C10 also has a larger reflex port and an 80W digital class D amplifier, double that of its sibling - so it’s able to delve an extra 5Hz into those bass frequencies, and with a lot more power. But apart from some rearranging of inputs to the rear, the rest is essentially the same. Both house a large circular volume control flanked by sets of four smaller buttons on the top: for power-on, play/pause, input selection and Bluetooth pairing to the left, and pre-sets to its right. Here is also where you’ll find the aux-in jack, which will save you having to tip the speaker forward and fumble around at its rear to find a connection. Inputs on each Audio Pro’s behind are reserved for more permanent fixtures, such as the power cord, ethernet cable and stereo RCA. These are alongside outputs for sub-woofer and USB device charging, as well as a toggle switch for optimised playback depending whether you’re using wi-fi or anything else. Before mentioning the sound, it’s also worth running the rule over the Link 1: another product of Audio Pro’s intuitive simplicity. Sized and shaped like an ashtray, its duties are to collect song selections from the app, connecting to your home network via either wi-fi or its ethernet input, and dispensing via whichever output you have selected. These are limited to optical and analogue auxiliary - though with a 3.5mm-to-RCA cable included, connecting to pretty much any existing set up could hardly be easier. That’s really about the size of it: for the £100 price of Link 1, any extra audio equipment – be it another Addon speaker or full hi-fi system – is now part of your multi-room network. It’s difficult to imagine a less stressful set-up procedure, either. The Audio Pro app seeks out all available products connected to the home network (with the option of adding those not already tethered manually), and they are then all there to manipulate as you wish. Living with the app is a slightly different proposition, though. In some ways it’s very simple - drag-and-drop to partner or separate speakers, either in stereo pairs or multi-room zones, and tweak the bass and treble at your leisure. But it can be a little buggy, and is certainly limited compared to most rival systems. The bugs are neither constant nor devastating, but the odd stutter and hang - particularly when pairing or splitting speakers - gets annoying in quite short order. Limitations, meanwhile, are felt in the requirement to leave the Audio Pro app in order to play music from Spotify or Apple Music, which leads to a rather disjointed user experience. It also means you can’t create on-the-fly playlists that incorporate tracks from those services and the others on board (Tidal, Qobuz, Napster and Deezer), or your own digitally stored collection. Audio Pro has sought to integrate Amazon’s Alexa voice assistant, but has done so via the app rather than a new speaker with a microphone. This implementation is, unsurprisingly, less useful - and again we experience some bugginess, with music changing in accordance with the voice command but the app acting as if still playing the previously selected music. But it’s important to point out the Audio Pro is far from the most limited multi-room app out there, and its occasional bug and rudimentary nature is forgivable when you consider the price and sound quality of the speakers it's controlling. The key to their performance is musicality unrivalled by anything at a similar price - or even quite a lot more. Take the Addon C5 as a starting point. Its level of detail is insightful, exposing the texture and timbre of each instrument and vocal line alike without underplaying cohesion or organisation in favour of nit-picking analysis. It also times with metronomic precision, but tempers it with the kind of dynamic sense that captures rhythmic emphasis nicely. And that dynamic expression is a strong positive over the speaker’s entire performance, able to reflect lavish shifts and subtle nuance alike. It simply does everything right, and without fuss. Now add the increased heft of the Addon C10 and the performance is predictably grander, able to rattle trinkets from the mantelpiece or twist our insides with its low-end authority. But does Audio Pro allow such gains to come at the expense of all we love about the rest of the family? Instead it steps up almost every aspect of its game. There is more space to the presentation, more three-dimensionality and ambient detail, greater headroom for more violent dynamic variation and an added maturity over the more delicate. Every penny of its loftier price tag is paid back with interest. The Link 1 perhaps shoulders a lesser burden in what is effectively a midwife role, but it performs its own specific task with equal aplomb. It fits our Addon T3 like a glove, which is of little surprise - but even hooking it up to feed Spotify into our reference hi-fi system doesn’t hold the performance back, despite the inherent limitations. So yes, the Audio Pro range is small compared to its multi-room rivals, and the app is a little lacking - and that might limit the overall appeal for some people. But for sound quality at the price, this system is currently unbeatable. As much as anything else, your chosen path for migration to multi-room should be about whose speakers you want around your house. For us, Audio Pro makes that particular decision admirably simple.